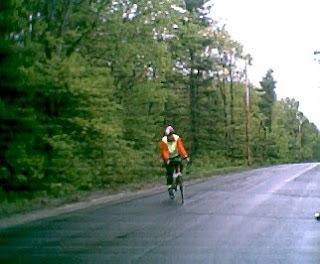 It was misting, drizzling, and spitting enough to require intermittent wipers on the way to the ride start at Belgrade Lakes last Saturday. The weather forecast had gotten progressively worse all week, to the throw-in-the-towel point of "100 per cent chance of showers" but I packed up my bike and a stack of ride maps and headed over to the Belgrade Community Center to see if anyone would show up. As I waited there, Denise pulled into the parking lot. 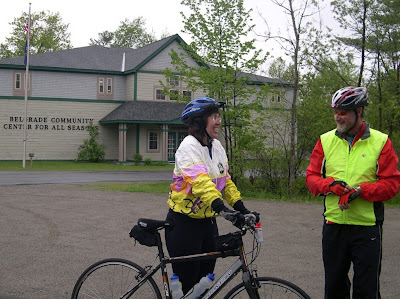 We discussed the weather and our route options - I mentioned that I had a piano recital to attend at 1 pm - and we had almost talked ourselves out of riding when Jim pulled in. 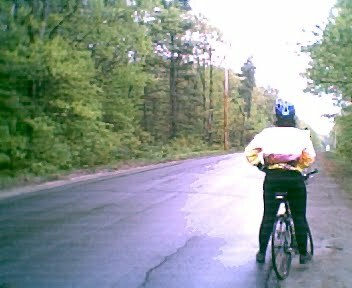 Almost simultaneously, the misting let up, Jim confidently cited a more optimistic forecast of rain to the south of us, and we talked ourselves back into riding again. It would prove to be a good choice. Not entirely convinced that the rain would actually hold off, we opted to set out on the 15 mile loop. The temperature and the winds were moderate, although the pavement was wet. We headed up the long hill out of Belgrade Lakes village on Rt.27. Except for the spray from an occasional passing car, the climb went well, and we warmed up quickly. We turned off onto Watson Pond Road and began the stepped climb up Blueberry Hill. For some reason it seemed steeper than usual - that wasn't part of the forecast - but soon enough, we were at the summit. As we contemplated the descent, it started drizzling again, so we pressed on, turning onto Castle Island Road. The rollers into the Castle Island Camps were fun - and pretty in any weather. By the time we got to Fast Fred's hot dog stand it was raining too hard to stop, even though Fast Fred was open for business. We headed back down to Belgrade Lakes village past the golf course, the rain starting to come down steadier. No dilly-dallying in the village - we headed up Rt.27 straightaway, and back to the Community Center. Packing up our bikes, it started to rain in earnest. Our hunch at the start was right - the weather held up just long enough for us to get the 15 miles in, and the three of us had a great ride. I was really glad that Denise and Jim had come and "coerced" me into riding on a very misty day.